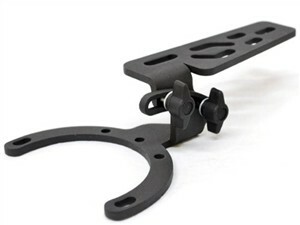 This adjustable tank mount is for your camera, GPS, phone, mp3 player, or video recorder. The first thing you should know about this item is that it ONLY fits Honda and BMW motorcycles with traditional gas caps in the top center of the tank. The reason for this is that it mounts around the gas cap. It comes with all the hardware required to mount several different types of equipment. With this item, you can adjust the placement of your equipment. We have all seen the numerous movies on YouTube made by riders with a camera mounted somewhere on their bike or on their person. Usually, the camera is mounted at a fixed angle, giving a rather uninteresting result -- with the exception of the guys who mount the camera and then proceed to do something incredibly dangerous, silly, illegal, or all of the above -- don't be that guy, please. An adjustable mounted camera gives you the opportunity to capture things around you, regardless of where they are, to a certain degree. The mount can also be used for radar detectors and EZ Pass for those long freeway trips. The mount is made of steel with a power-coating of black. It is easy to install and remove, and it is quite affordable as well. You can also keep your valuable electronics waterproof with this mountable travel case.